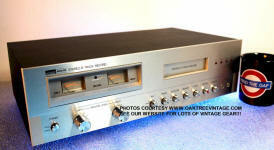 Used & Vintage Stereo 8-Track Cartridge Tape Decks… Ready to GO! 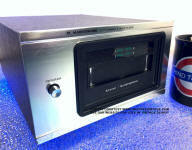 RESTORED / REFURBISHED / FULLY SERVICED & Fully Tested with a 90 day Warranty! & recorders / players. 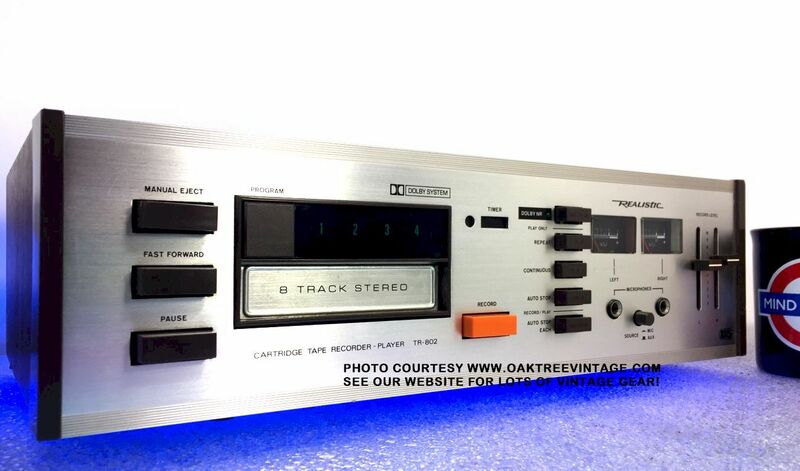 Our 8-track decks are refurbished with a 90 day warranty. 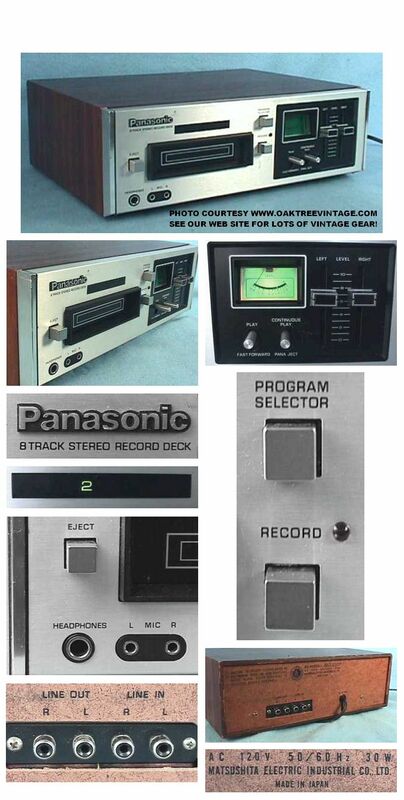 Quadraphonic 8-track / 4-channel 8-track tape players / recorders. 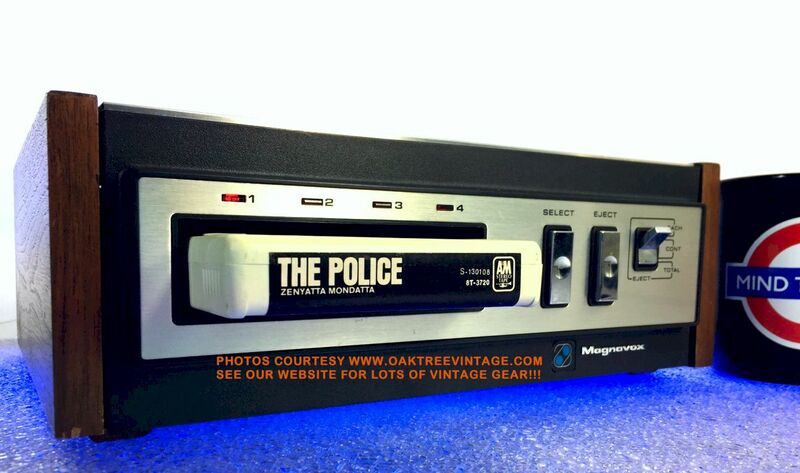 Great for transferring your 8-tracks to CD / DVD ROM or computer hard drive. MORE GEAR BEING ADDED PERIODICALLY. ü Our technician has completely gone through and 'Certified' this unit. ü We have completely and extensively gone through the mechanicals and electronics of this unit. ü Entire transport was disassembled down to the chassis, and every mechanical part was cleaned of "varnished" lubes and re-lubed as well as the always at issue, Pinch Roller plunge assembly, re-lubed and reassembled. ü Main drive belt has been replaced with NEW for trouble free service. ü Capstan flywheel removed, cleaned, burnished and re-lubed prior to re-install. Entire transport and mechanism has been cleaned, re-lubed and de-magnetized. ü Program change mechanism and indicator contacts cleaned / burnished and re-lubed for trouble-free program changes. All original program indicator lamps now work fine. ü Heads have been cleaned and de-magnetized and are in great shape. ü Head azimuth & track cross-talk adjusted for optimum performance and the best high-frequency response (not normally expected from 8-track cartridge performance) utilizing RCA #356 and 8TSC-101, Aspen 'Deck Tester' and Audio-Tex 30-312 Test / Alignment tapes, a dual trace Oscilloscope and frequency counter. ü Track alignment adjusted to eliminate 'cross-talk' between tracks and to ensure the best high-frequency response (not normally expected from 8-track cartridge performance) utilizing RCA #356 and 8TSC-101, Aspen 'Deck Tester' and Audio-Tex 30-312 Test / Alignment tapes, a dual trace Oscilloscope and frequency counter as well as our 'best' pre-recorded tapes. Deck now has clear sounding highs even when using pre-recorded tapes. ü Internal playback, meter and record level pots also adjusted w/ O-scope. Since we also burnished the program track light contacts, they all light and are responsive. Unit works and sounds GREAT! 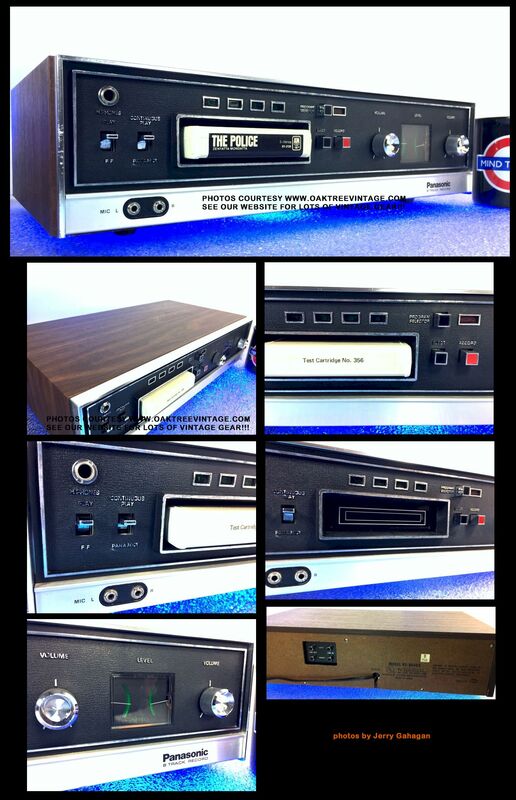 This machine would be perfect for burning your 8-track collection to CD. *While it does record, it's a much better deck for 'Playback' as there's 'WoW' introduced in the recording process, that does not show up with 'Playback'. Meters even w/ factory test tone tape. Deck looks great with only minor scuffs, striations mostly around the 'Headphones' jack. Works and sounds GREAT! Total tech time in this deck 7.5+ hours. 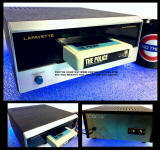 Great quality 8-track cartridge play / record deck. This is a great deck for transferring a large amount of tapes to another media as it has two very important features. LOCKING FAST FORWARD and AUTO-STOP. These features are used to find the beginning of track one without going past the beginning of the next track. Trying to do a lot of transfers, as a business without those two features, waiting on a tape to 'play through' will cost a lot of time / money! Again, have completely gone through it making ready for playback for listening to or burning your collection. Also, again a perfect deck for a 'media transfer' business as it has 'Locking FF' and 'Auto-Stop'. Great for burning your tape collection to another media. Looks good and works GREAT! Includes our standard 90 day limited warranty. Measures 17.25" wide x 10" deep x 5.25" high and weighs 11 lbs unpacked. ü Track change 'pick-up / contacts' cleaned and burnished (although this should be a step in normal deck maintenance). Now deck changes tracks consistently. ü Program change mechanism and indicator contacts disassembled, cleaned / burnished and re-lubed for trouble-free program changes. All original program indicator lamps now work fine. 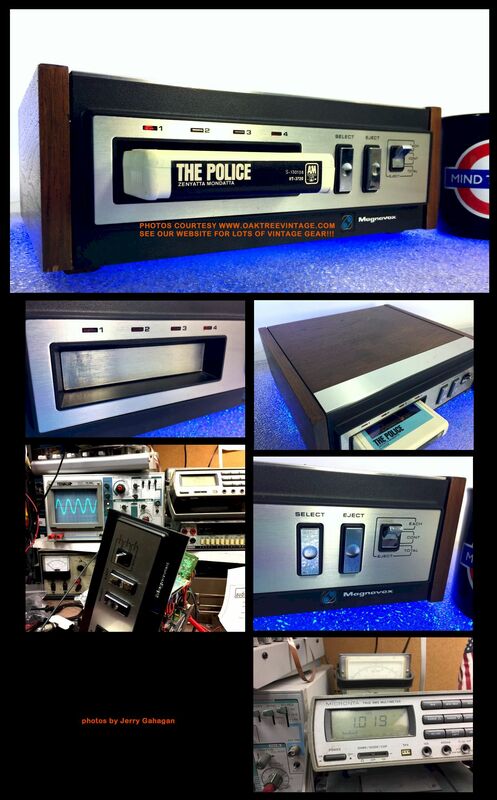 This machine would be perfect for burning your 8-track collection to CD. This is also a great deck for recording (one note on recording on it is to try and max the meters a the "L" and "R" characters on the meters, depending on the type of tape used. Meters even w/ factory test tone tape. Looks, works and sounds GREAT! Total tech time in this deck 9+ hours. Again, have completely gone through it making ready for playback for listening to or burning your collection, or for making "new" 8-track tapes for listening in your vintage or muscle car. All functions work great. Also, again a perfect deck for a 'media transfer' business as it has 'Locking FF' and 'Auto-Stop'. Great for burning your tape collection to another media. Cosmetically the only issues are the typical wear to the 'silver' details on the front silk-screening on things. Looks good and works GREAT! Includes our standard 90 day limited warranty. Measures 16.5" wide x 10" deep x 4.5" high and weighs 11 lbs unpacked. ü Heads have been cleaned and entire transport has been de-magnetized. ü Main drive belt has been replaced for trouble free service (after original had turned to 'goo' as many do). ü Internal, linear record switch flooded with cleaner to eliminate 'motor boating' and other common issues. ü Track indicator contacts burnished. ü All track indicators, while 'dim' function. ü Head elevator cleaned and re-lubed. ü Capstan bushing cleaned and re-lubed. ü Internal PB, REC and METER PC Pots cleaned and adjusted for 0dB with Oscilloscope. ü Floor noise measured @ -60dBm. ü Checked for 'WOW' and 'Flutter' by recording test tones and dynamic piano cuts. Piano even sounds fairly decent and that's a difficult thing to do with an 8-track 'cartridge' tape deck. ü Deck has clear sounding highs even when using pre-recorded tapes. 'Technician Note', "This is among the best sounding decks for playback we've restored". ü Looks good and other than the above mentioned tape counter, ALL works GREAT! Total tech time in this deck 6.5+ hours. 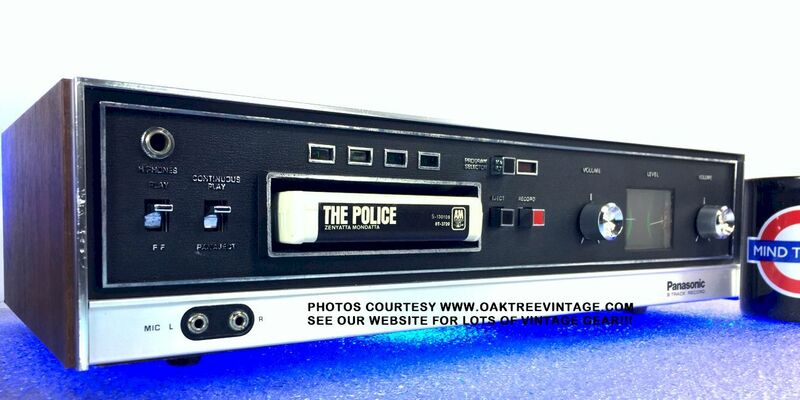 Great quality 8-track cartridge play / record deck. We recorded from a CD onto a new 8-track cartridge and it sounded as good as a cassette and many Reel to Reels! Quality tape transport. 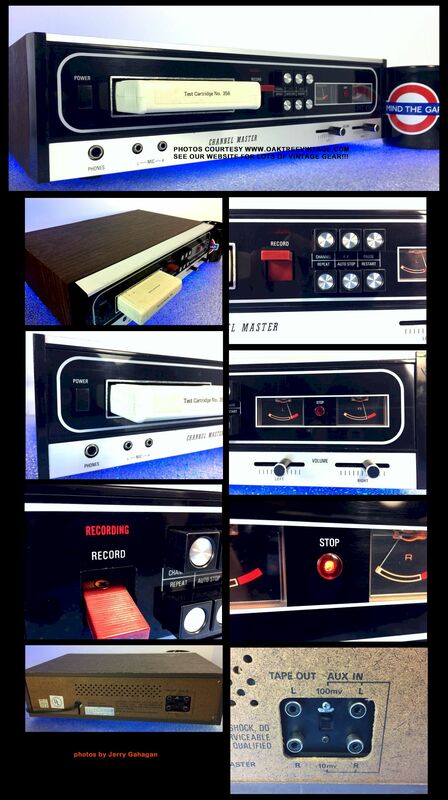 Great for making "new" 8-track tapes for listening in your vintage or muscle car. All functions work great. - Auto-Stop after end of each track or Continuous play. Invaluable when archiving large 8-track libraries. This feature coupled with a "Locking" Fast Forward are must haves for that use. Auto-Stop works on 'record' as well. Again, unit looks and works great and is ready to use! (Tape cartridge shown in photos not included with deck). Includes our standard 90 day limited warranty. Measures 15.25" wide x 10" deep x 4.25" high and weighs 9 lbs unpacked. ü Program change mechanism and indicator contacts cleaned / burnished and re-lubed for trouble-free program changes. All original program indicator LED's now work fine. ü Nylon head mounting bracket 'proactively' epoxied as 8-track decks utilizing nylon to mount their heads will OFTEN break, rendering them completely useless. While this can usually be repaired, we epoxied this one as 'reinforcement' before it broke. 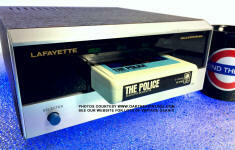 the best high-frequency response (not normally expected from 8-track cartridge performance). 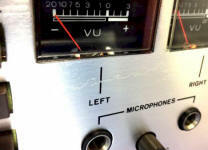 Deck now has clear sounding highs even when using pre-recorded tapes. ü Record signal path contacts cleaned and burnished for static-free performance. Records VERY well at -1dB w/ 1kHz test tone on NEW Normal Bias Tape. 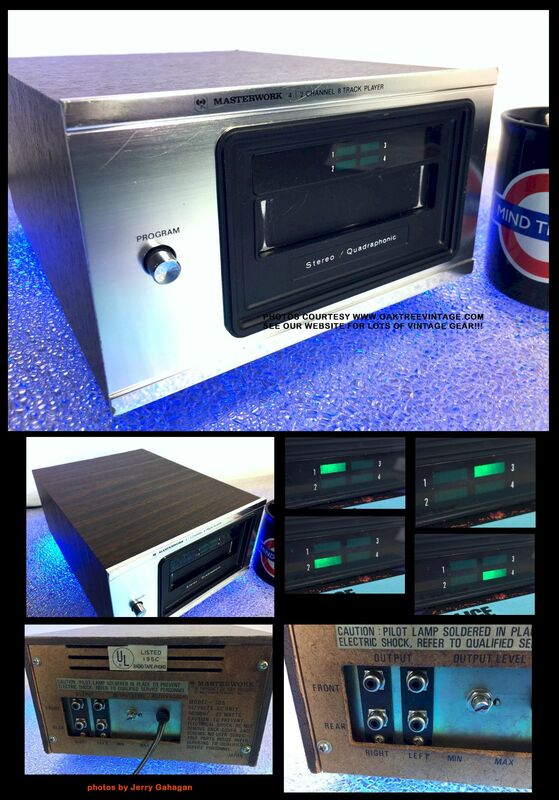 This machine would be perfect for burning your 8-track collection to CD. Tape speed tested to 98+% accuracy! Meters even w/ factory test tone tape. Cosmetically it looks great. We did add some 'matte' finish laminate, to the lower, front edges to cover some previously added holes for rack mounting. See above photos). Total tech time in this deck 6+ hours. Deck looks good with only minor scuffs, striations and works GREAT! Great performing Wards, 6827A 8-track. 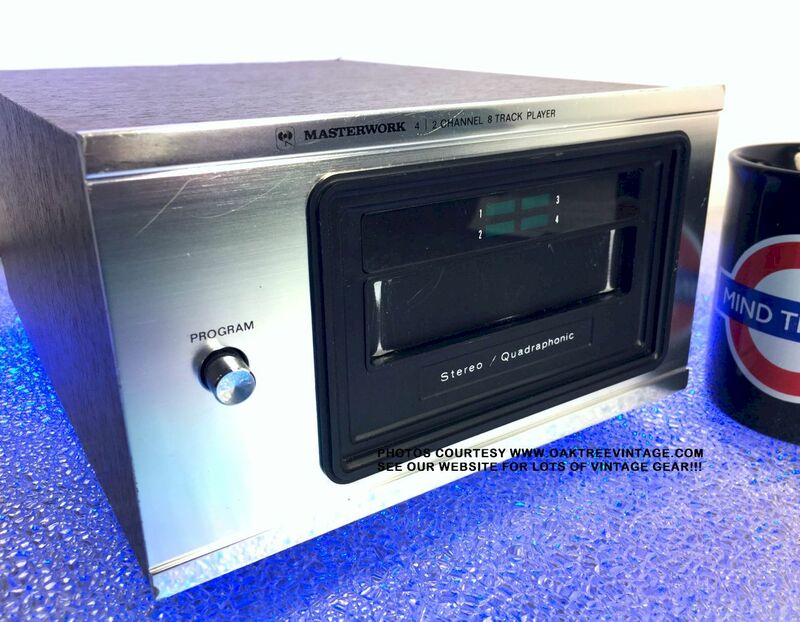 Great for listening to your tape collection, burning your tapes to another media or for making "new" 8-track tapes for listening in your vintage or muscle car. 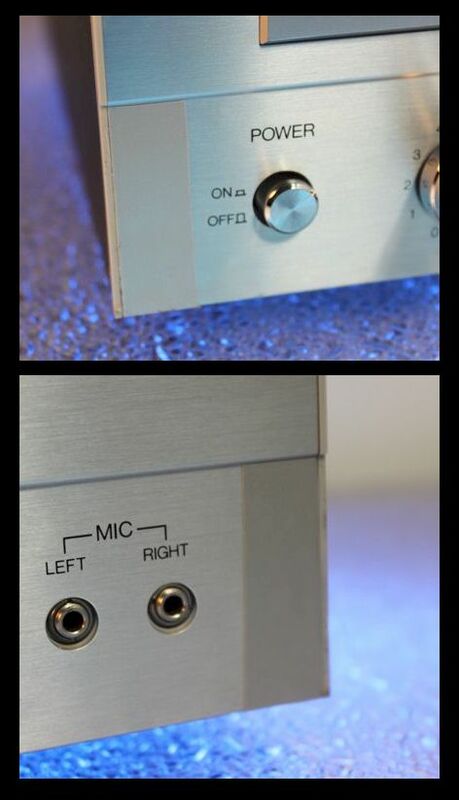 - "ALC" Automatic Level Control for recording. 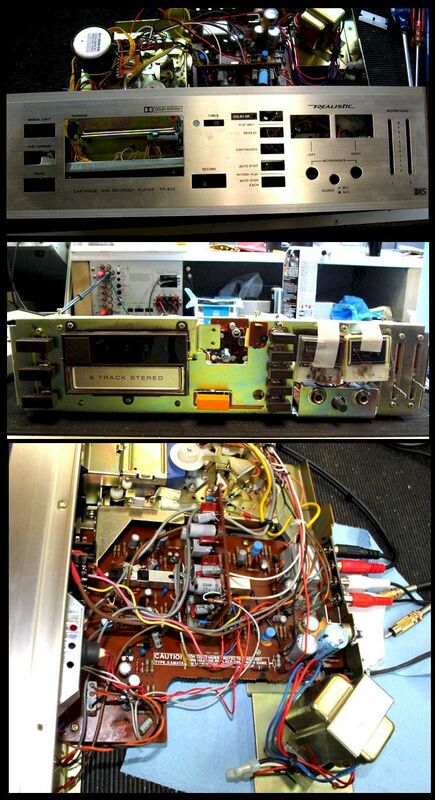 Again, we have completely gone through this unit, refurbishing and then testing with great "sonic" results for an 8-track. This machine would be perfect for burning your 8-track collection to CD or computer and making new tapes for your show / muscle car. Again the only issue is the non-functioning "Auto-Stop". 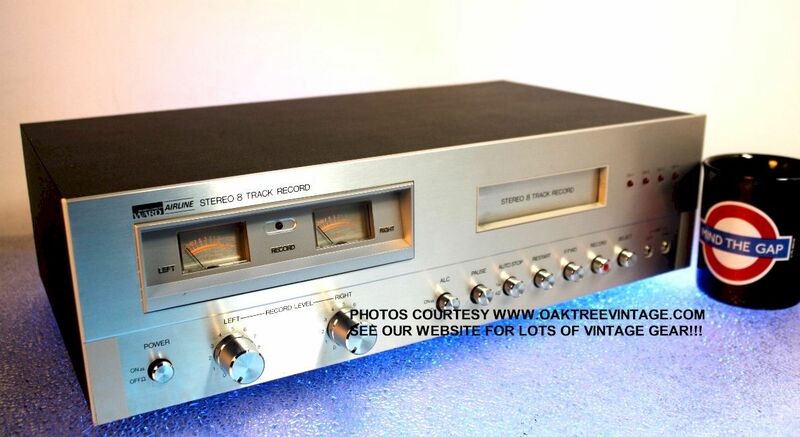 One unique feature of this deck as opposed to many 8-tracks is that it allows "Cueing" / monitoring of audio signal when in Fast Forward mode. Unit looks good with a few minor "battle scars" and sounds GREAT! (Tape cartridge shown in photos not included with deck) Includes our standard 90 day limited warranty. Measures 17" wide x 10.75" deep x 5" high and weighs 11 lbs unpacked. ü Program change mechanism and indicator contacts cleaned / burnished and re-lubed for trouble-free program changes. All original program now lamps work fine. ü Track alignment adjusted to eliminate 'cross-talk' between tracks and to ensure the best high-frequency response (not normally expected from 8-track cartridge performance). Deck now has clear sounding highs even when using pre-recorded tapes. This machine would be perfect for burning your 8-track collection to CD. Cosmetically decent, except for a couple of 'dings' on the top edge of the face plate. See above photos). Total tech time in this deck 5.5 hours. As stated above, we have completely gone through this unit, refurbishing and then testing. This machine would be great for burning your 'Stereo' 8-track collection to CD or computer or for playing your 'Quad' tapes for Old School Surround Sound. This deck is one of the BEST sounding decks we've done in a long time. Reproduces way more 'top end' than most 8-track decks we finish, and also has a VERY strong output amp which vastly improves signal to noise ratio. Bottom line is, "IT SOUNDS GREAT!" Cosmetically looks decent with typical, minor scratches and 'insertion' wear to the tape door sides. Includes our standard 90 day limited warranty. Measures 8" wide x 10.5" deep x 5" high and weighs 6 lbs unpacked. This is a 'players' unit, and not going to win any beauty contests. It's got a few scratches on the top of the case, and numerous dings / dents around the edge of the front bezel (see lower, right photos above). You're paying for it's performance following the above tech time, not it's attractiveness (or lack there-of). It's for 'use'n' not 'look'n' at. 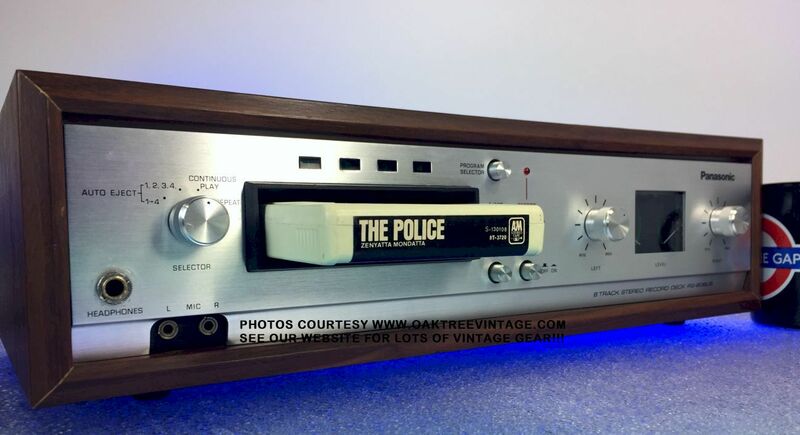 As stated above, we have completely gone through this unit, refurbishing and then testing with amazing results for an 8-track. This machine would be perfect for burning your 'Stereo' 8-track collection to CD or computer. Sounds great! Includes our standard 90 day limited warranty. Measures 9" wide x 10" deep x 4" high and weighs 10 lbs unpacked. Total tech time in this deck 8!!! hours (way too much). As stated above, we have completely gone through this unit, refurbishing and then testing. This machine would be great for burning your 'Stereo' 8-track collection to CD or computer. Sounds great! Includes our standard 90 day limited warranty. Measures 11" wide x 10.5" deep x 4" high and weighs 9 lbs unpacked. 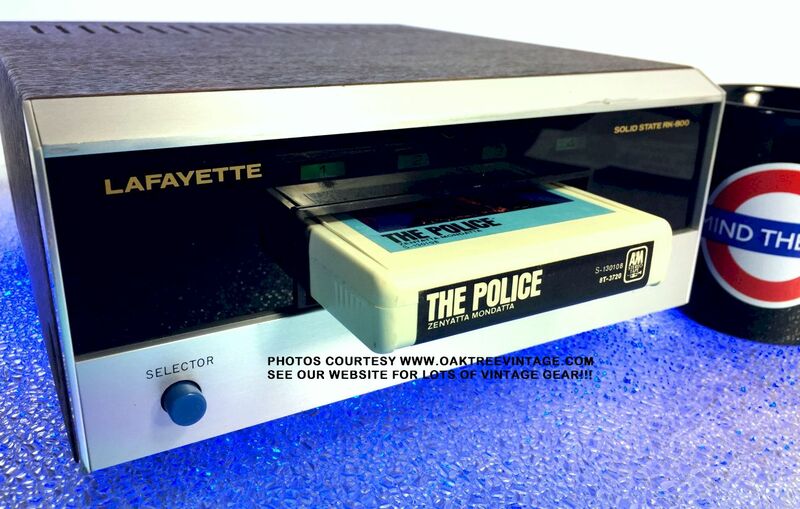 Due to the age, conditions in which many 8-track tapes have been stored in and subjected to and the inherent quality shortcomings of the 8-track cartridge format (ie; case shape tolerances, and pressure pad designs), most tapes will not sound as good as most of today's modern formats and likely not as good as even their original, limited quality sound. We've moved most of the "SOLD" items to their own page. 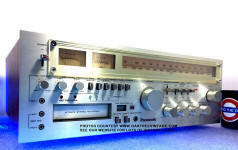 ü Head azimuth adjusted with alignment / test tape and O-Scope for best High Frequency and channel to channel Signal Phase. Records VERY well w/ 1kHz test tone on NEW Normal Bias and / or Chrome Tape. 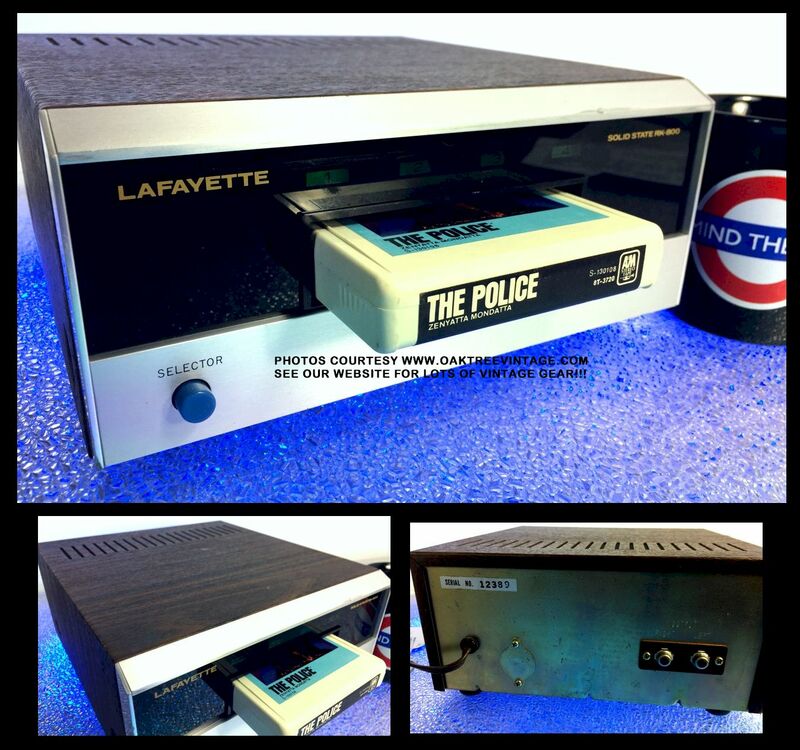 This machine would be perfect for burning your 8-track collection to CD. Tape speed tested to 98.8% accuracy! Meters even w/ factory test tone tape. Cosmetically there's a few minor dings / scuffs around the face edge (mostly on bottom edge) and some brown 'paint' dripped on the left side panel (we didn't try and remove as it's not offensive and didn't risk damage to finish. See above photos). Deck looks good with only minor scuffs, striations and works GREAT! 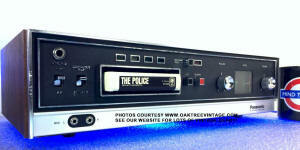 Great quality 8-track cartridge play / record deck. 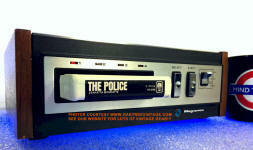 This is a great deck for transferring a large amount of tapes to another media as it has two very important features. Momentary Fast Forward and Auto Stop. These features are used to find the beginning of track one without going past the beginning of the next track. Trying to do a lot of transfers, as a business without those two features will cost a lot of time / money! Again, have completely gone through it making ready for playback for listening to or burning your collection. Great for burning your tape collection to another media or for recording new 8-tracks from CD or iPod for your classic Muscle Car. Looks good and works GREAT! Includes our standard 90 day limited warranty. Measures 16.75" wide x 9.5" deep x 4.5" high and weighs 11 lbs unpacked. ü Nylon head clamp has been repaired (most decks utilize a 'nylon' head mount, and we haven't seen one in a LONG time that hasn't been cracked, allowing the head to 'droop'. This MUST be addressed, or the head would never align to the tape). ü Main drive belt has been reconditioned for trouble free service. ü All track indicators function. ü Floor noise measured to 0.3mVAC. ü Deck has clear sounding highs even when using pre-recorded tapes. This machine would be perfect for burning your 8-track collection to CD or making tape for your 'Antique Muscle Car'. One issue with every TR-802 / 803 we've had (and we've had quite a few) is they always have non-functioning, non-repairable tape counters. They have an inherent issue with a small nylon gear around a steel shaft that after 30 years, cracks, thus locking it up every revolution. The same thing happens to many Pioneer and Craig 8-tracks, as well as a few others (since the tape counters were primarily made by one company for most electronics mfg's to use). There are two types of Realistic TR-802/803 8-track tape counters; those that have already have cracked gears and those that are just about ready to have cracked gears. The "work-around" for this is to remove the linkage belt, and cover the tape counter opening. - Auto-Stop after each tape or at end of each track or Continuous play. Invaluable, Time / Money Saving feature when archiving large 8-track libraries. This feature coupled with a "Locking" Fast Forward are must haves for that use. Auto-Stop works on 'record' as well. Again, unit looks and works great and is ready to use! (Tape cartridge shown in photos not included with deck). Cosmetically about the only thing worth mentioning is a light, 'wiggly' scratch on part of the face plate (see photos above). Includes our standard 90 day limited warranty. Measures 16.5" wide x 10.5" deep x 5.25" high and weighs 9 lbs unpacked. ** "(actual as measured)" refers to original test results done by Hirsch-Houck Laboratories upon test release of product when new. Current "aged" specifications / performance may of course vary from that.